This Spring I had the privilege of spending my Sundays watching some excellent football in the Allianz National Football League Division 4. There aren’t many who watched each team this year. Some good matches and some very good football was on display, I must say I really enjoyed travelling around watching Carlow, Laois, Antrim, London, Leitrim, Waterford, Limerick and Wicklow. Dr Cullen Park in Carlow and Wicklow’s home ground Aughrim will always be places I love going to. Sadly, the snow over the past few weeks put a spanner in the works and led to several matches being postponed. And then worse, cancelled altogether. I think that the GAA has dropped the ball on not rescheduling the Division 4 games which currently remain to be played. For teams in Division 4, whether they will admit it or not, the league is the big competition of the year. If it isn’t, it should be. They get games against teams at their own level, and the opportunity to pull themselves out of the basement and into Division 3 and onwards. There is the opportunity to build and be competitive in a way that the championship doesn’t permit. Now we are left with these teams having played one game less – Leitrim have only had five games. Many will only get two championship games this summer, losing both. That’s the reality. Worse again, the league has been demeaned by the GAA in not fulfilling these fixtures. What competition, anywhere, is called off as soon as a champion is identified? My team of Division 4 is below. There are excellent footballers in the division, spread among all teams. The team I’ve picked is just my own appraisal from the games I watched, I didn’t see every game played. For example, Wicklow have some good players but when I watched Wicklow play Laois they were totally outgunned and it was very difficult to pick anyone out from their side. Donal O’Sullivan (Limerick) – excellent kickouts, Limerick’s strategy and O’Sullivan’s delivery were very impressive. Good shot stopper and all-round footballer. Peter Healy (Antrim) – pacy, skilful footballer. Defended well and got forward to good effect. 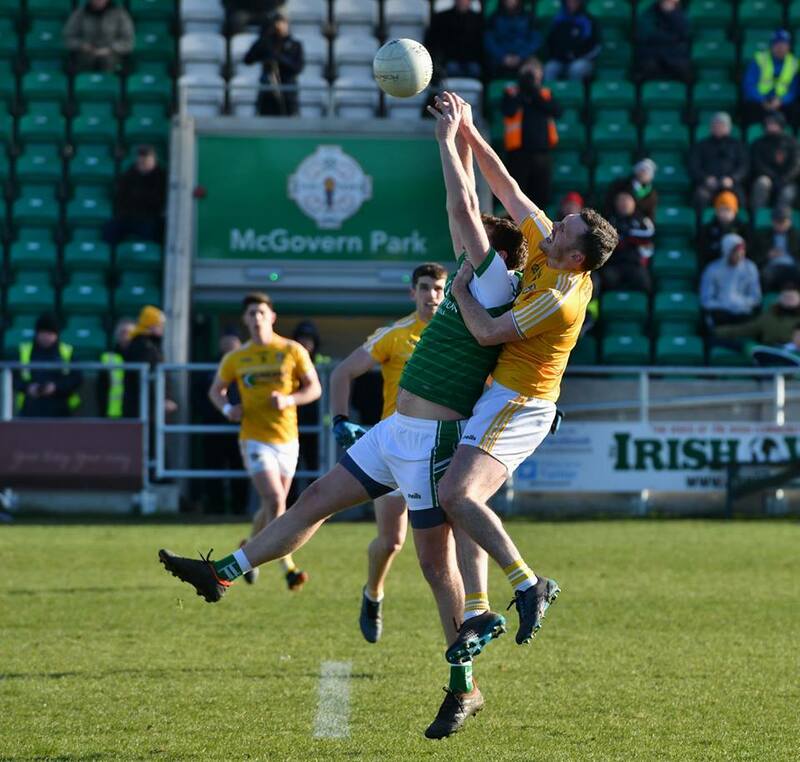 Michael McWeeney (Leitrim) – strong, tenacious defender who’ll pick up opposition’s most dangerous forward. David Connolly (Limerick) – sweeps across the D shielding his man marking colleagues, very good reader of the game. Shane Ryan (Waterford) – good reader of the game, does a great job picking up loose opposition runners. 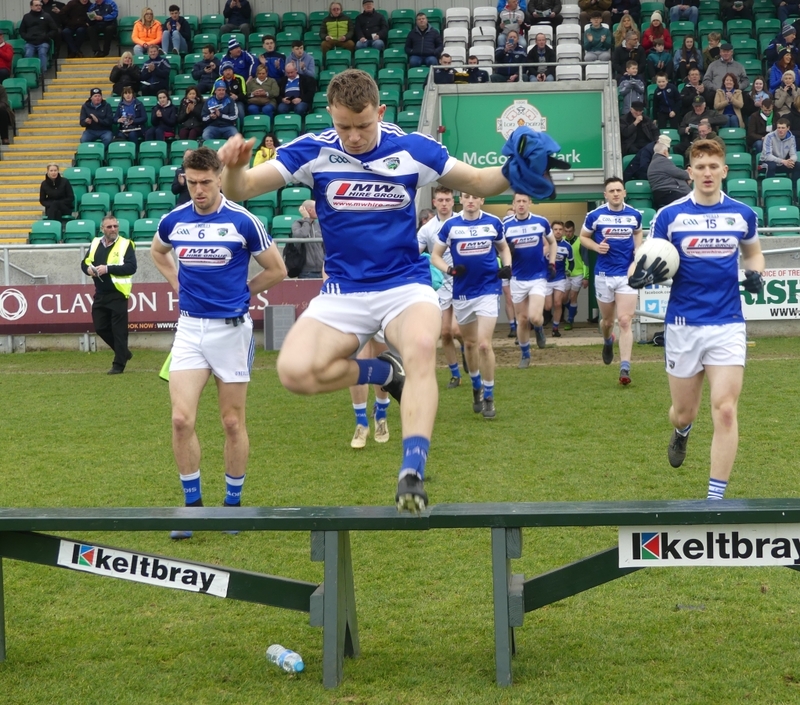 Colm Begley (Laois) – strong, good in the air, reads the game well, times attacking runs perfectly, shields full back line. Adrian Moyles (London) – more known as a forward, looked very good at wing back when used there. Brendan Murphy (Carlow) – excellent throughout the league. Gets forward to kick scores, works hard off the ball and has curtailed discipline issues. Game changer for Carlow when on form. Sean Murphy (Carlow) – teak tough and virtually unstoppable when soloing towards goal. Works hard and one of the fastest players in the country. Darragh Foley (Carlow) – one of my favourite players in the league. Total all-rounder, good aerially, kicks scores, defends well. Very important to Carlow’s game. Liam Gavaghan (London) – lead London brilliantly. Scores, carries really well and wins kickouts, excellent all-rounder. Paul Kingston (Laois) – lovely footballer. Great vision to pick out teammates and a dangerous scorer. Gary Walsh (Laois) – now suspended by Laois for the League final as a result of a tweet, but was superb in front of goal for Laois throughout the league, scoring 4-41 in just 6 games, almost 9 points a game. Ryan Murray (Antrim) – very quick,agile and tough to mark, even more so with his brother Conor feeding him from the half-forward line. I must also mention the following players: Daniel St Ledger (Carlow), Sean Gannon (Carlow), Kieran Butler (London), Donal Wrynn (Leitrim), Keith Beirne (Leitrim), Darren Hayden (Wicklow), Sean O’Dea (Limerick), Seamus O’Carroll (Limerick), Trevor Collins (Laois), Kieran Lillis (Laois), John O’Loughlin (Laois), Ross Munnelly (Laois), Evan O’Carroll (Laois), Niall McKeever (Antrim), Conor Murray (Antrim), Paddy McBride (Antrim), Matthew Fitzpatrick (Antrim). All were really impressive when I watched them. The quality of goalkeepers in the division was excellent. I picked Donal O’Sullivan in the above team, but Chris Kerr of Antrim, Gavin McEvoy of London and Graham Brody of Laois were top class. Brody in particular, with his adventurous runs upfield, was class. The league final between neighbours Carlow and Laois is exciting. The irresistible force meets the immovable object. Laois going forward are superb: Paul Kingston, Ross Munnelly, Evan O’Carroll, Eoin Lowry, Lillis and O’Loughlin coming from midfield, and the prospect of Gary Walsh missing tempered by the likelihood of Donie Kingston taking his place. Carlow, on the other hand, are the best team defensively I’ve watched this Spring. They have a very effective system, three Murphys, Gannon and Foley are big men who work their arses off around the middle and their backline give up few chances. I genuinely can’t pick a winner between the two. I’m delighted for both they’re going up. What does championship hold for the Division 4 teams? Laois start out the Leinster championship against Wexford, and I’d have them as favourites to beat them. The winners will have Westmeath, and if Laois get through that’s a game I’ll go to as I think it’ll be serious stuff in every sense of the word. Laois are not happy where they are and they’re hungry. Carlow will not fear Louth in their Leinster championship opener. Louth had a poor league and both sides will be in Division 3 next season. Carlow are on the crest of a wave and it will be a great test for them. The winners will play Kildare, Carlow again would cause them serious trouble if they get through. Antrim will be very disappointed to have failed to gain promotion from Division 4. They, in some ways, were unlucky to have had a Carlow team on a mission and a quality side like Laois in with them this year. If they can keep their squad together, keep their heads down working away between now and the Down game, they could put out a very good performance against their neighbours. London have had their best league in years and look to be forever improving under Ciaran Deely’s management. A Connacht first round match with Sligo will be a big challenge, but a winnable one nonetheless. The league performance should give them confidence and they’ll be looking to kick on with a big championship performance. Leitrim had a mixed league, some good performance mixed with poor ones. If they can get Dean McGovern, Michael McWeeneny, Donal Wrynn, Emlyn Mulligan, Ryan O’Rourke and Keith Beirne all fit and on the pitch at the same time, they should overcome New York in their game. But it is definitely a potential banana skin. Waterford are rightly disappointed that a game against Leitrim now won’t happen. It would have been a big test, and they’ll be happy to have beaten London to finish their league positively. A game against Tipperary in the Munster Championship will be tough, and they will surely be big underdogs for it. Limerick had a tough league. They’ve lost a lot of their panel and are starting from a low base. They play a Clare team performing really well and holding their own in Division 2. It could sadly be a short summer for Limerick I fear. Wicklow are a side I worry a lot about. They have struggled at midfield for a few seasons, to the point of persuading James Stafford back out of retirement. Two draws is all they managed in the league, taking hidings from Laois, Leitrim London and Carlow along the way. Offaly aren’t the worst draw for Wicklow in Leinster, but I can’t see them playing more than two games this summer.